I was at Dollar Tree the other day and came across these cute little plastic mason type jars. 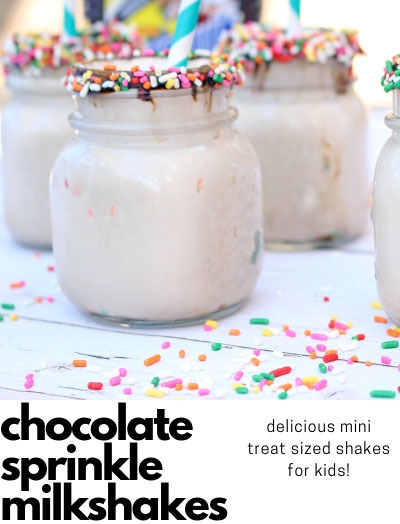 I knew I had to grab them because there are so many little fun projects you can do with little jars. 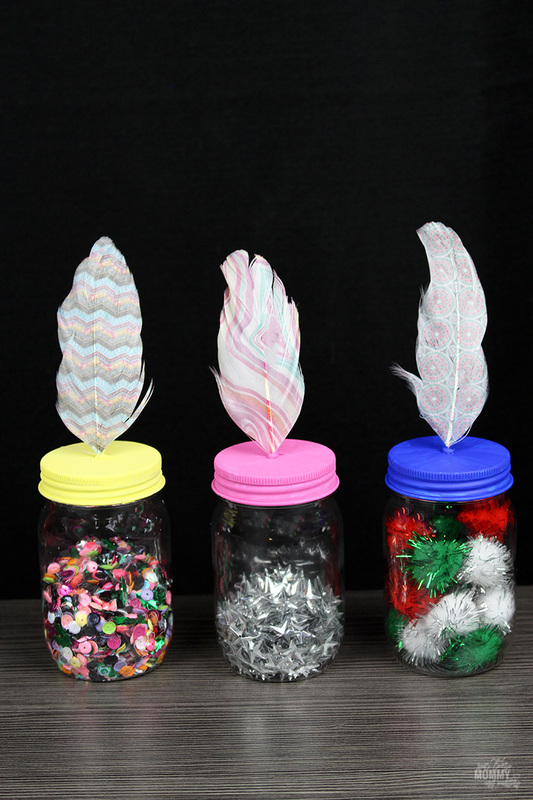 These Decorative Storage Jars for Kids are the perfect addition to any room or desk and you can add just about anything that will fit into them inside! I’ve had these jars for over two weeks and really didn’t have any idea as to what to do with them. Then Ava was telling me she really had nowhere to put her art and craft supplies like her pom poms, her sequins and things like that. So I told her I’d figure out something to do with these jars that would make them a cute addition to her room. 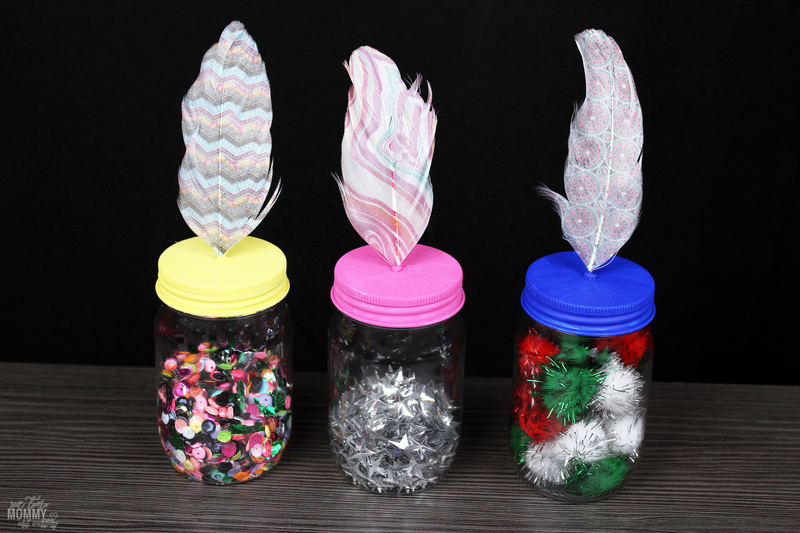 That’s when she came up with the idea of adding paint to the lids and feathers to make them a bit more decorative! I thought, well that beats anything I could think of plus it would be super cheap to do because we already have everything on hand to do this! 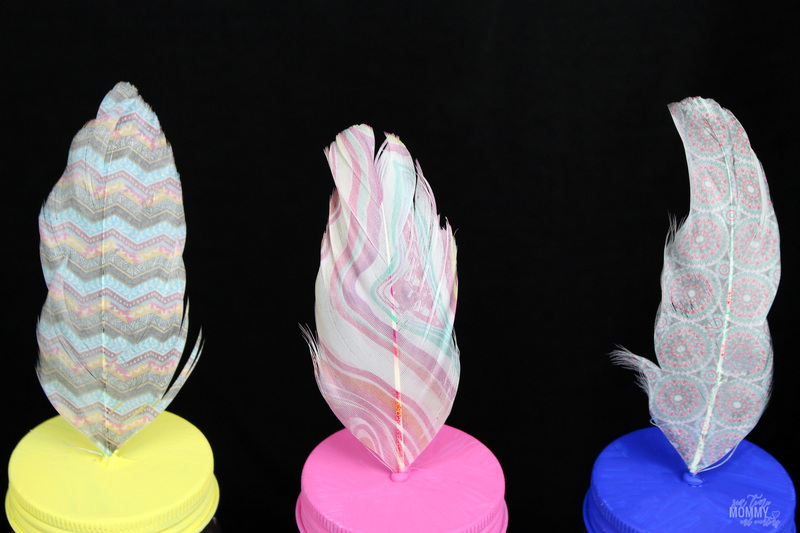 For these, we used feathers we already had in the house. They were falling off some pens we had gotten at Dollar Tree a few months back so I figured instead of going out and buying new ones we’d use these. 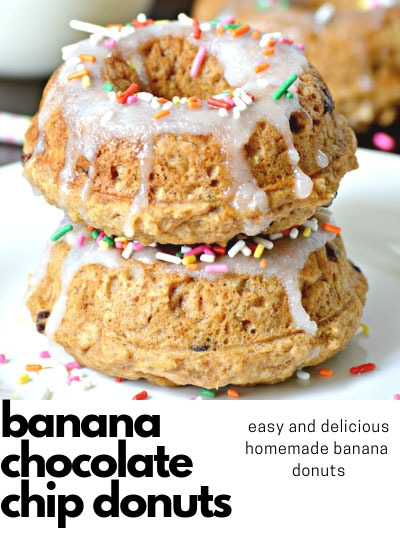 They are a perfect size and it’s a great chance to upcycle! Using a darker paint color like the blue leaves marks. It’s unavoidable, I tried multiple different techniques and nothing worked. I needed to use this specific blue due to the feather though if you can pick a different one. Keeping the colors close to what the colors are in your feathers makes them really look adorable and keeps them tied together. 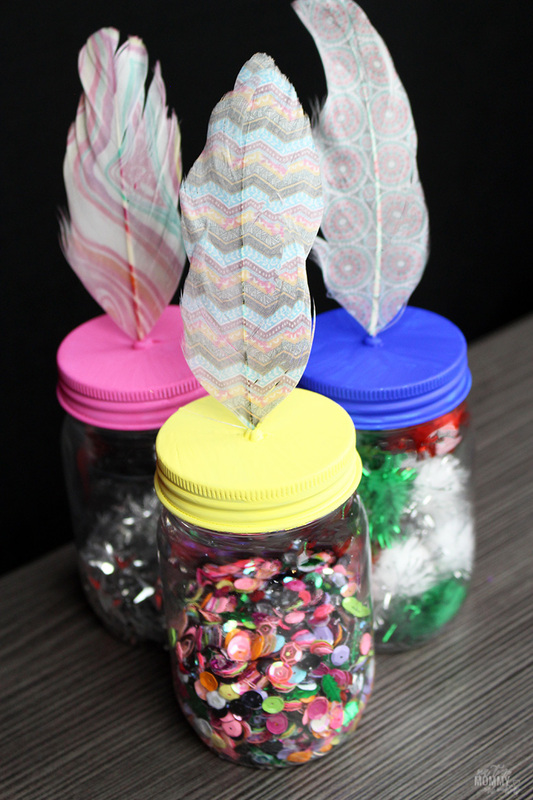 NOTES: You can use any feathers, or glue that you have on hand. I recommended a glue gun or crazy glue though as white glue and/or a glue stick really wouldn’t be ideal or work well. I would also recommend a bigger paintbrush than what I used for the darker colors so you’ll have fewer markings/blotches. 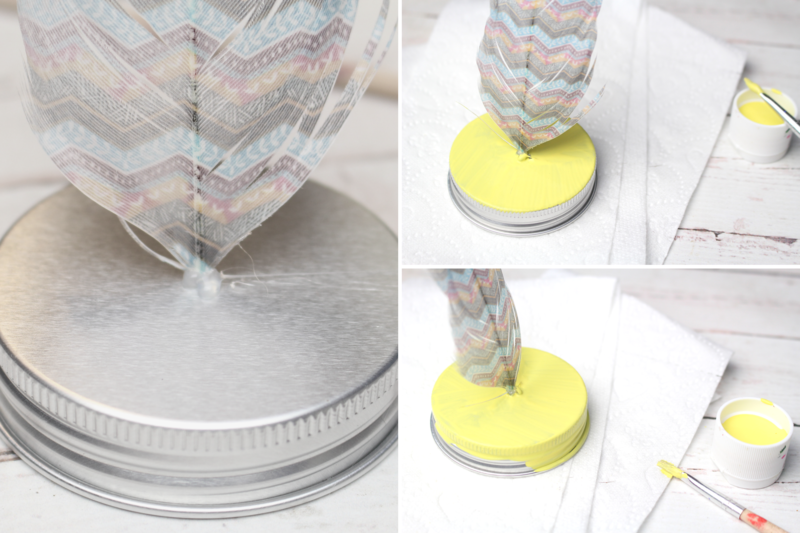 After heating up your glue gun place a blob of glue on the top of the jar lid, and a quickly stand the feather up in it. Holding in place for 2 minutes. 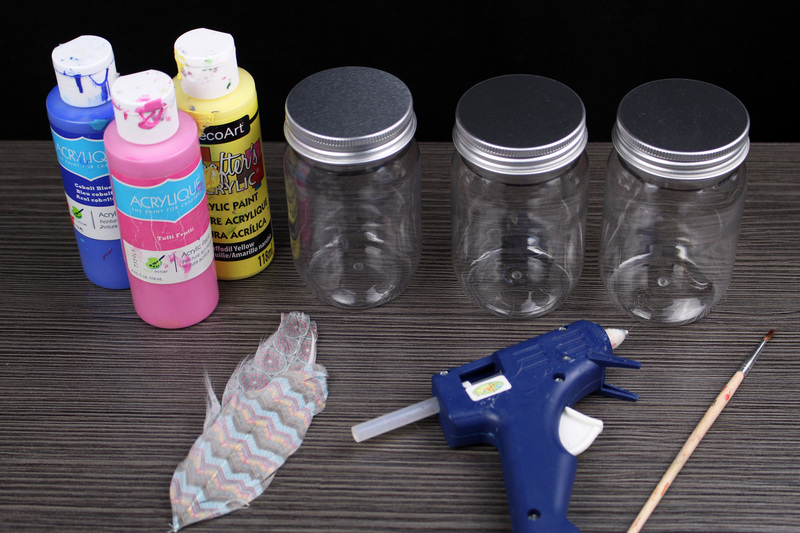 Let them dry, fill up your jars then screw the lids on to the tops of your jars! Easy and cute. I don’t like hard and drawn out DIY/Decor projects so this was such a breath of fresh air being able to finished them in about 20 minutes, and it only took so long because of paint drying! You can use these for just about anything too. Doesn’t have to be arts and crafts related. Makeup brushes, spices in the kitchen, buttons, needles for sewing, pretty much anything that can fit in a jar. I do believe these also come in different sizes too, so they are great for a lot of things!